The DC-9-80 was the natural result of stretching the already stretched DC-9-50 by a further 4.34m. During the early 1980s it gained a large number of orders (especially from AA) prior the arrival of the 737-300/400 and the A320 series. Service entry was with Swissair on October, 10 1980 and eventually 1,191 aircraft were built. The type is still in service with both American Airlines and Delta whilst many aircraft have gone on to have productive careers in the developing world. The marketing name MD-80 came into use in 1983 and DC-9-81s became MD-81s. The MD-82 and MD-83 were uprated variants with better engines and in the latter case greater fuel capacity. The MD-88 variant, which entered service in 1988, was a further updated MD-83 with a new cockpit and other technical features. All these variants share the same fuselage, however the MD-87 has a 5.28m shorter fuselage than a standard MD-80 and a fin extension above the tailplane. The MD-87 also introduced the screwdriver rear fuselage type, which has since 1987 become the standard tail for all MD-80s and has been retrofitted to many earlier examples. One of the Jet-X releases and four of the New Jet-X releases have been MD-87s not standard length MD-80s so technically have separate moulds. The MD-80 has been rather ignored by manufacturers with many obvious models missing (Delta widget, AirCal, Frontier, Muse Air, Transtar, New York Air, SAS, Alitalia, Finnair, Swissair, Airtours, Iberia etc etc etc. New MD-80 models are still released but it is a trickle rather than a flood. 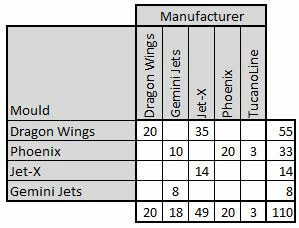 Jet-X and Dragon used to mould share a lot though the bulk of the 54 releases on this mould have been made by the former (34 to 20). As with most Dragon moulds its a one-piece mould which means there are no ugly seam lines on the fuselage - though there is one where the horizontal stabilisers meet the tail. It is an older mould and has several issues but is nonetheless respectable give nits age. The nosegear doors are too big but overall the nose shape is good. Likewise the horizontal stabilisers are not angled downward correctly but the tail is otherwise fine. Probably the most obvious problem is the engines. They are much too small, however you only really tend to notice this when doing a direct comparison with a photo or other moulds as their shape is fine. Another bonus for this mould is that there are two versions one with the original pointy tailcone and one with the screwdriver tail (see the Reno Air below). The screwdriver tail is actually not very good and doesn't really match the flat scalloped side of the real thing; the original cone however is very good. Even with its issues this has been the mould to beat in the MD-80 range for many years. One year after Dragon another MD-80 mould appeared this time in the form of 3 releases from TucanoLine. From 2004 Phoenix tookover use of the mould and have released 18 models in 10 years. Between 2006 and 2014 Gemini borrowed the mould to make 10 essentially identical Allegiant releases. The mould isn't awful but it isn't very good either! It is hamstrung by the nose shape, which appears too chunky and round. Early versions like this Crossair edition clearly show the undercarriage is also an issue with the mould. Rather than the slightly nose down look it ought to have the model has a slightly nose up aspect which looks weird. The horizontal stabilisers are not angled down enough and lastly the model has two seams - at the wing root and horizontal stabilisers. The mould only comes in a screwdriver tail version. In 2014 Phoenix replaced the ugly static gear with rolling gear which has improved the mould considerably as can be seen from this China Eastern example. Even so I'm still not a fan and the fuselage still appears too level with no nose down attitude. This mould's not for me and appears to have fallen out of usage anyway. In 2009 the new Jet-X, no longer associated with Dragon Wings moulds, created its own MD-80. 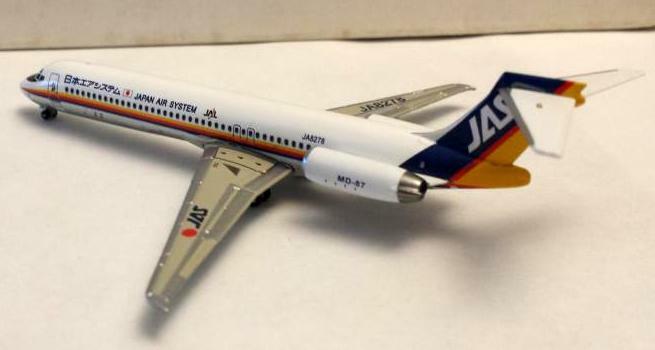 The mould appears ok except the nose appears to be too long and as with the Gemini/JC MD-90 below there appears some thickening of the lower fuselage moving forward ahead the wing. The nose length is possibly accentuated by Jet-X's regular issue of not printing the cockpit windows high enough - so they sometimes appear to be slipping down the nose. Otherwise the mould is not bad and at least has no seams. Jet-X have released 10 examples between 2009-2011 and the company now appears dead. There are less airlines than you might expect as Jet-X released both Chrome and Polished versions of the same model for their AA, Aeromexico and JAS releases. The mould does have the nose down aspect of the MD-80 however it looks like it may be a bit too nose down. Gemini had apparently had an MD-80 in the works for a long time and its arrival in 2013 was much anticipated. Sadly the first release, American Airlines was close to a disaster as it appears that something definitely went wrong in the production of the model leaving the area forward of the wing, especially the nose, very variable. That the model was released in such a state says something rather disturbing about Gemini's quality control, which has to be further questioned with the recent (2014) return of Zinc Rot in some Gemini models. Overall the rest of the mould is pretty good but the nose is awful. There is an obvious pinching in at the bottom by the front door. This looks weird and almost like two moulds have been cut and shut. This could also be the reason the mould is too low at the front. It makes the fuselage look fat! As others have mentioned the nose gear is too far back by at least half its width which makes the nose look too long. The overall effect from the side looks pretty bad. Fortunately it appears that the long break of over a year between the first MD-80 release and the second (both were AA releases) gave Gemini some time to fix the worst issues with the mould. The backend of the model is superb. The downward angle of the horizontal stabilizers at the top of the T tail is well finished, however the top of the tail is too angular and flat topped. The rest of the tail and rear fuselage is spot on and very importantly the engines are suitably chunky and well sized. The shape of the underside of the nose is ok, although the nosegear is still too far backwards, kind of sits into the line of the body rather than against it and the gear doors are way too small. The biggest problems are on the top side of the nose. It is too pointy coming down from the cockpit, which itself is too sloping leaving the cockpit windows kind of pointing up rather than straight. The whole thing just looks wrong and is I’d say inferior to the old Dragon mould and miles away from Aeroclassics superb DC-9 nose. Having said that it is still passable. Unfortunately it's a little academic, as in 3 years Gemini have used the mould only 7 times, despite having screwdriver and pointy tail cone versions. It's a crying shame as this version of the mould is superior to the old Dragon mould in everyway except for the nose. 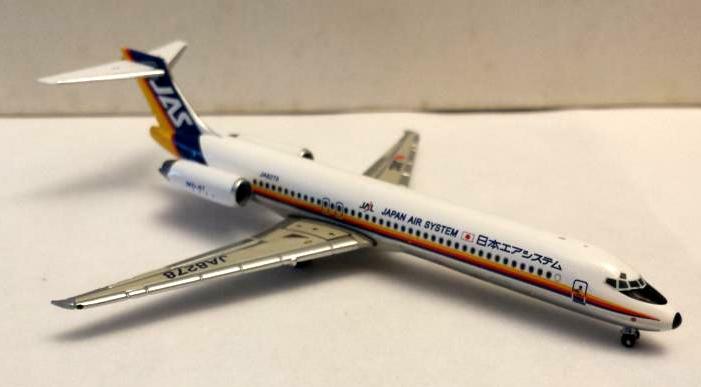 Despite their being two separate MD-87 moulds only 5 aircraft have actually been made in 1:400 and four of these are Japanese examples. Visibly the major difference between the MD-87 and standard MD-80s is the fuselage length and the straight topped vertical stabiliser. The old Jet-X's single example uses a modified edition of the original Dragon MD-80 mould whilst the 4 new Jet-X releases use a similarly modified example of the 2009 Jet-X mould. Both share the same failings as their parent moulds, but overall aren't bad efforts - in fact the Jet-X MD-87 being shorter than the MD-80 actually looks better I think.